Senior Sit Down: Sam Schwartzstein talks about Big Game and his experience on the Farm. Redshirt senior center Sam Schwartzstein (64) is a preseason candidate for the Rimington Trophy and last year helped the Stanford offensive line set a school record for touchdown passes. A redshirt senior in his final season on the Farm, center Sam Schwartzstein is known as one of Stanford’s most vocal leaders on and off the field. 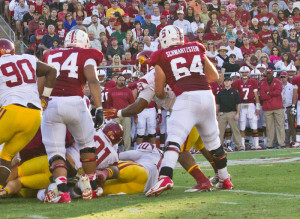 A preseason candidate for the Rimington Trophy as the nation’s top collegiate center, Schwartzstein came into his own last year as a first-year starter when the Cardinal offensive line helped Andrew Luck lead the Pac-12 in passing efficiency and completion percentage along with school records for single-season touchdown passes. The 6-foot-3 Southlake, Texas. native played for tradition-rich Carroll High School, winning the Texas Class 5A state title during an undefeated 16-0 season his junior year. Schwartzstein sat with The Daily to use his unique perspective as one of five fifth-year seniors on the roster to talk all things Big Game and Stanford football. The Stanford Daily (TSD): With Big Game looming, you have a different perspective than a lot of the other guys on the roster having been there before. How do you take on a leadership role knowing a little better what to expect on Saturday? Sam Schwartzstein (Sam): It’s one of those things where, I’m an out of state guy, I come from Texas, and everyone knows Texas vs. Texas A&M’s rivalry, or the Oklahoma vs. Texas Red River Shootout. Not as many people understand the enormous effect Big Game has on the Bay Area. It really is one of the biggest metro areas in world where everyone looks to the one game all year long. A lot of times people don’t care about the season, just what happens in Big Game, because you’re working with someone from Cal if you’re from Stanford, and you probably work with someone from Stanford if you’re from Cal. You just have to let everyone on the team know, “Hey this is that Iron Bowl, this is that Biggest Cocktail Party, it’s one of those games so just understand that this means a lot to you, and the team.” We’re trying to go out and win the Pac-12 North, but it’s also a community game and everyone’s rallying round this one game. TSD: Coming from Texas, where the Big Game isn’t traditionally as well-known except in certain circles, what was your first Big Game like and how do you think it has changed? Sam: At that time in my freshman year, it was one of the most important Big Games in Stanford history, and we didn’t do what we were supposed to do. We were 5-4 going into the final three games, and we needed to win one of them to go to a bowl game, which would have been our first bowl game in a decade. And we lost those three games, the last one being in the Big Game at Berkeley. When you see the axe go to them, you understand “Wow, we really lost.” Now it’s all about having to come back and win that axe and go to a bowl game. TSD: Much has been made of the Big Game being played in October for the first time since the first game in the rivalry began back in 1892. With the game moving up in the schedule, and you guys having a lot of conference games to focus on even after Big Game, does that change things for you from a preparation standpoint? Sam: You know, it doesn’t really. When we looked at the schedule in January, we said, “Wow, I wish [the game] was the same week as rivalry week, the same week as all of those Texas A&M, Texas games. But you know what it’s coming at the perfect time in the season—it’s an emotional game and a chance to get back on the right track. TSD: Speaking of getting back on track, how do you bounce back from Notre Dame? It’s always painful losing, especially close games, but what about for the younger guys on the team who really aren’t used to losing in their college careers? Sam: Well we were focused going into the last week, but what you learn is that it takes that much more focus to win. It’s kind of perfect to have Cal next, because there is that emotional side to the game, and we just have to instill in the young guys what this means to the team for the season as a whole. And coach Shaw preaches about going out and getting that hardware. He wants physical, tangible evidence that we are successful, and the axe is the crème de la crème of that evidence. TSD: What part of Big Game and all of the festivities do you enjoy the most? Sam: I’d say hearing from older guys and alumni, talking about how this is the game. You hear it all the time with games like USC or Notre Dame, but with the Cal game you see everyone wherever they might be thinking about it. I mean, I’ve got friends in Georgia talking about Big Game, you feel the nationwide attention on the game. TSD: Is there anything about being on the other side of four Big Games that makes you appreciate things more this last time around? Sam: When you hear the stories about the axe exchange, and the stealing of the axe, it takes a more community aspect rather than just being about the game itself. Those are the things I find that are the coolest, because that’s what made the game important over time. The Red River Shootout is during the Texas State Fair and there is so much community around it. This game has more history, more hate for each other on both sides—mutual respect but mutual hatred—and it’s one of those cool rivalries that I didn’t really understand before. TSD: Ok, quick hitters to close it out. Who’s the funniest guy on the team? Sam: James Vaughters. He just has a demeanor about him. When you look at him you think, “Man that guy’s a centaur.” And you never can really understand how some of that stuff would come out of the guy’s mouth. TSD: What’s the most difficult thing about being a fifth-year senior? Sam: Understanding that you’re six years older than some of the freshman. I mean some of them were born in 1994. Understanding that I was already in school when they were born. I was playing college football when they were in seventh grade. Sometimes I can’t believe this is happening. But that’s the culture shock of being a fifth-year senior. TSD: Favorite class at Stanford? Sam: STS 200, my senior colloquium. Science, Technology and Society is my major, and the class just brings everything together. It’s an interdisciplinary course and I took a communications route, but you could take a different approach with things like symbolic systems, computer science, civil engineering, psychology, sociology. But everyone is together in the same class and we collaborate on ideas on a certain topic. Our topic just so happened to be food, which I love, so being able to collaborate on that topic with all the other people and perspectives was just unbelievable. TSD: Thanks so much for sitting down to talk, Sam.